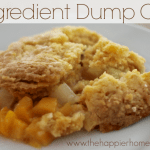 3 Ingredient Dump Cake and Summer Recipe Link Party! 3 Ingredient Dump Cake and Summer Recipe Link Party! Drain fruit cocktail and add to oven safe baking dish. Sprinkle yellow cake mix over all of fruit cocktail. Pout melted butter over cake mix. Back for 25-30 minutes or until golden brown.